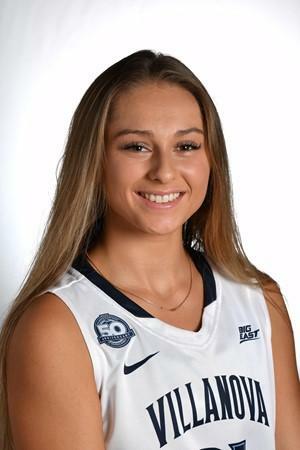 SOUTH ORANGE, N.J. – The Villanova Wildcats traveled to South Orange, N.J., on Friday night where they tallied a 70-66 comeback win over the Seton Hall Pirates. With the victory, the Wildcats improve to 12-7 overall and 3-5 in Big East play, while the Pirates fall to 12-7 overall and 4-4 in conference action. Seton Hall led 54-45 with 8:06 remaining in the game, when senior forward Jannah Tucker and junior forward Mary Gedaka took over the game. Following a Tucker three that made it 54-48, Gedaka scored on a post move in the lane to pull the Wildcats within four at 54-50. A 15-foot jumper by Pirate guard Inja Butina increased the Seton Hall advantage to 56-50, before Tucker answered on the next possession with another three and the Wildcats trailed 56-53 with 5:42 to play. After Desiree Elmore connected on a foul line jumper to give Seton Hall a 58-53 lead at the 5:27 mark, Villanova ran off 11 straight points to take a 64-58 lead with 1:09 remaining. Gedaka was dominant in the run scoring 10 of Villanova's 11 points on a conventional three-point play, three field goals and a foul shot. Trailing 67-62 with 29 seconds on the clock, the Pirates made it a one possession game when Elmore scored on a driving lay-up in the lane and was fouled. Elmore missed the free throw, but Seton Hall grabbed the offensive rebound. The Pirates then cut the lead to 67-66 on two free throws by Shadeen Samuels. Villanova inbounded the ball to redshirt freshman Emily Esposito who was fouled with 21 seconds remaining. Esposito missed the first and made the second to make it a 68-66 game. Out of timeouts, Seton Hall raced the ball up the court and had four shots to take the lead or tie the game, but all four were off target. The Wildcats sealed the win when Gedaka made two free throws with four tenths of a second to play. In the win, Gedaka scored a team-high 20 points and grabbed a team-best nine rebounds. She was 8-of-10 from the field and 4-of-6 from the foul line. Senior guard Adrianna Hahn (Ursuline) scored 16 points on 6-of-10 shooting, while Tucker had 14 points, including four three-point field goals. Esposito was the fourth Wildcat in double figures with 13 points. Seton Hall was paced by Samuels who had a double-double with 27 points and 16 rebounds. Butina added 22 points and eight rebounds, while Elmore scored 10 points. For the game, Villanova was 25-of-53 from the field (47.2%), 10-of-28 from three (35.7%) and 10-of-16 from the foul line (62.5%), while the Pirates shot 36.4 percent from the floor (24-of-66), 15.0 percent from behind the arc (3-of-20) and 83.3 percent from the charity stripe (15-of-18). Seton Hall owned a 49-27 advantage on the backboards. The Wildcats were charged with just eight turnovers. Villanova returns to action on Sunday, Jan. 27, with a road game at St. John's. Tip-off at Carnesecca Arena is set for 2 p.m.
NOTES: Villanova improves to 42-22 all-time against Seton Hall with tonight's win… The Wildcats improve to 42-22 all-time against Seton Hall with tonight's win…Villanova is 13-3 in their last 16 trips to Seton Hall…The Wildcats have won 11 of the last 15 versus Seton Hall... Mary Gedaka is 16-of-19 from the field in the last two games for 84.2%...Villanova improves to 6-3 on the road this season…Adrianna Hahn moved past Denise Dillon and into 10th on Villanova's all-time scoring list with 1,362 career points…Villanova was 10-of-28 from three-point range tonight. This is the 11th time this year that the Wildcats have made double digit threes.